This analytical balance gets stable stand from its die cast aluminium housing. The glass weighing chamber avoids wind influences. 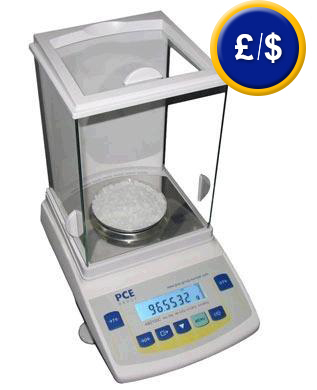 Designed for uncomplicated performance, the PCE-ABZ 100c balance has only those features necessary for routine weighing along with a few design and performance extras that help eliminate common nuisances that can arise in laboratory, industrial and educational settings. The analytical balance is not overloaded with features seldom used in routine weighing applications, and comes with only those needed in laboratory, industrial or education settings. The integrated RS-232-interface enables you to automatically send the weighing data into a sequence table by using the optional software-kit. The calibration procedure includes laboratory calibration process and ISO certification. The customers name and address is filled in. These certificates are comparable to NIST and UKAS certificates. They are accepted all over the world. The kit includes a software for transferring the weighing data to a PC or Portable and a RS-232-cable. The transferred data can also be sent to other calculation software as Excel ... The standard software is in English language (others are available (French, German ...). In case your PC or Portable uses USB-Interfaces, you can use the adapter in connection with the standard RS - 232 - Cable. A small software (covering the actual drivers) is included. The printer is used for direct output of weighing data. It will be delivered including RS-232-cable, usb-cable, net adaptor and 1 roll of paper. Density determination is performed by means of Archi-medes' principle (buoyancy method), which is also the method used by the density determination kit for balances. This method allows determination of the density of solids, viscous and pasty substances, as well as liquids.